**~ A POCKET FULL OF ROSES~**: I WON! I WON! I WON! Wishing you a fun & safe 4th of July weekend too my bloggie friend!! How beautiful that painting is!! Lucky You!! What a luck lady you are to have won a painting from Jonny! She is a true master with the brush..
Congrats on being the winner of this amazing painting. You are so blessed. I know you will enjoy it. Thank you for sharing Lynn's giveaway too. You are such a doll and so loved by all. Love to you dear bloggy friend. Oh you lucky ducky you! 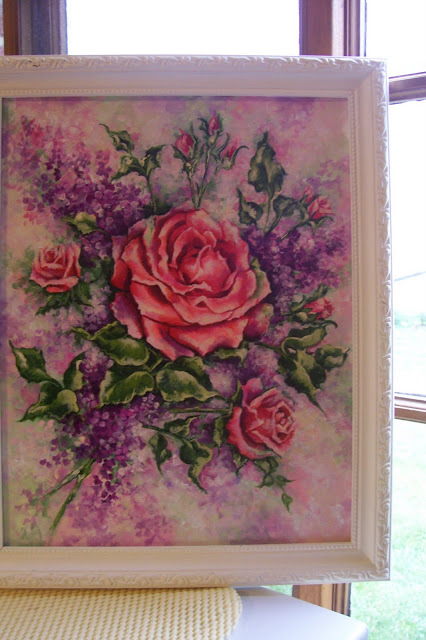 The painting is gorgeous and I love the roses with lilacs!! Will have to go check out the artists site!! thanks for stopping by, you were a lucky girl, that's beautiful..Oh to have that kind of talent!